From ancient Indian medicine to the modern beauty rituals, organic neem oil treats all the skin concerns. 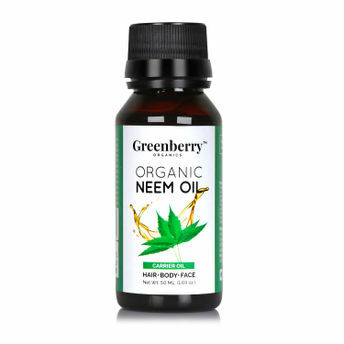 The Greenberry Organics Organic Neem Oil has essential astringent properties that naturally settle noticeable scars, mild acne, pigmentation, mild irritation, and mild inflammation. Suitable for body and hair, it detoxifies and rejuvenates the skin and scalp. Explore the entire range of Massage / Carrier Oils available on Nykaa. Shop more Greenberry Organics products here.You can browse through the complete world of Greenberry Organics Massage / Carrier Oils .Alternatively, you can also find many more products from the Greenberry Organics Organic Neem Oil For Face Body & Hair range.